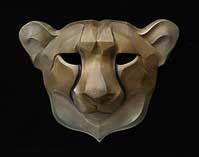 This is the second in the series of African animal masks inspired by my last trip to Africa. 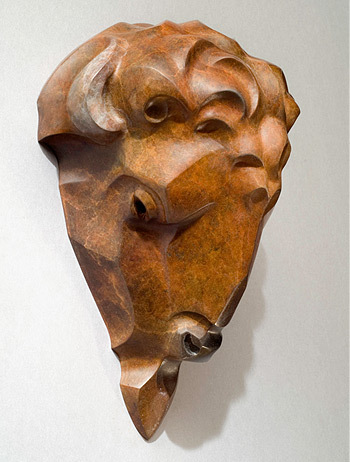 I selected animals with heads and faces that I found especially interesting from a sculptural point of view, and so, of course, I had to include the magnificent male Lion. I never tire of finding different ways to portray this splendid cat, with the endless design possibilities presented by his magnificent mane. 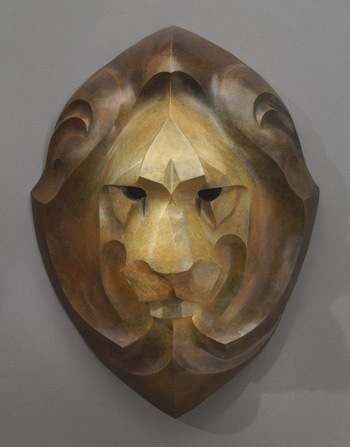 This mask has a rather formal, symmetrical, almost shield-like shape, very appropriate for this regal "King of Beasts". On my last Tanzanian safari, we were treated to lots of up-close encounters with Giraffes and I think that most of us agreed that they were some of our favorite animals. Not to project human traits on the animals, but the Giraffe's slow-motion gait and serene and expressive face, with deep, liquid eyes and long lashes, manifest a peacefulness and gentleness that it's hard not to fall in love with. There aren't many animals more formidable than the Cape Buffalo. The stare of a large male is all the warning one needs to approach no further. The males will surround the females and young and face a perceived threat face-on, knowing that there are very few animals (man included) foolhardy enough to try to penetrate that line of defense. 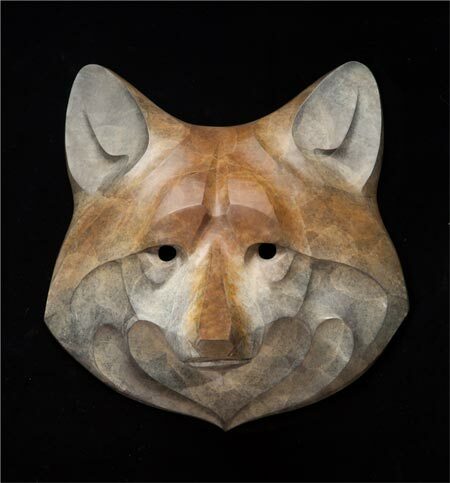 The strength and determination of that challenge are the qualities that inspired this mask. 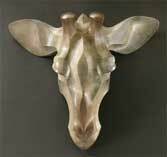 Elephant Mask Maquette 5.5" x 4" x 1"
The African Elephant's magnificent ears provide a natural frame for this most unusual of faces. 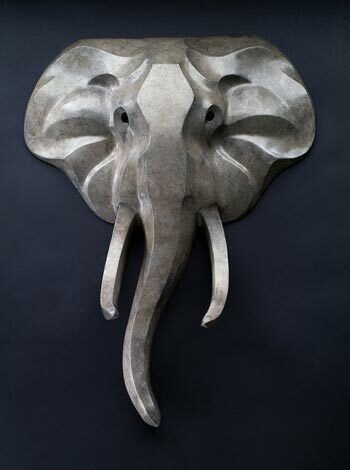 As if the trunk and tusks weren't enough for an interesting design, the unique shape of the head and it's large, wise eyes make the African Elephant's head a sculptor's dream, even more meaningful in light of recent research that tells us of the great intelligence and strong family ties manifested by this gentle giant. 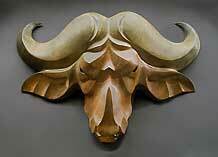 The wildebeest is the animal that first convinced me to do a mask. I don't quite know what to say about the wildebeest's head - somehow the word "strange" keeps coming to mind. Actually, the whole animal seems to have very strange proportions, quite front/top-heavy with that huge, long, bearded, curly-horned head almost seeming to account for a quarter of the beast's total mass. This is truly one of the most unique of the African plains animals. The latest in my series of African Animal Masks, this one depicts one of my most favorite animals. Since I’ve used the mask series as a means of sculpting the most unique and expressive part of animals I might not otherwise pick as sculpture subjects, I haven’t done masks of many of the big cats. But I do so enjoy exploring their feline forms that I jumped at the opportunity when one of my gallery’s clients wanted to commission a Cheetah Mask. Number 1, of course, went to him, but the rest of the edition is available. 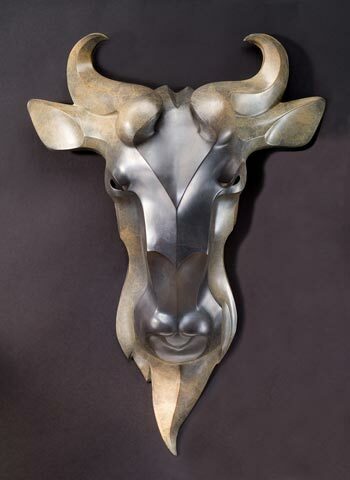 Nothing expresses the essence of the American West like the Bison, whose herds once covered this land, so this is the animal I've chosen for my first mask in the American Animals series. Today we can find them in small herds scattered throughout the west, protected by the government or owned by private individuals. This magnificent bull was ruler of such a small private herd in Montana, not far from Glacier National Park, where I spent hours on the back of a pick-up truck sculpting his magnificent head. The huge head, made even more formidable by the ample top-not and beard, so overpowers the slender hind quarters, it almost makes one wonder if the rest of the body is needed at all. 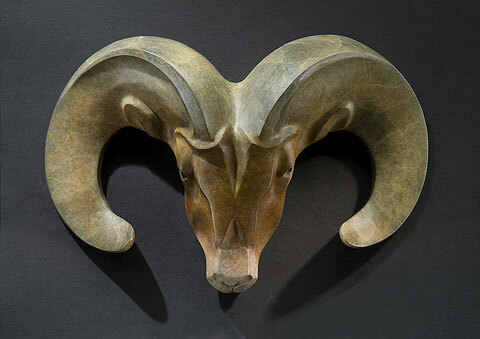 The magnificent horns of the Bighorn Ram are recognized worldwide as a symbol of strength and power, combined with an almost delicate beauty that sets this animal apart as an esteemed member of our prized natural heritage. But he’s not just good looking. Anyone who has watched these awesome animals navigate rocky cliffs with agility and speed can attest to that. I once watched a male pursue an uninterested female all over the face of a cliff and was sure, more than once, that they were both going to miss a ledge and plunge into the Big Thompson River below. 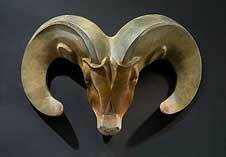 Of course, they didn’t, but the ram did have to go home alone, at least that time. 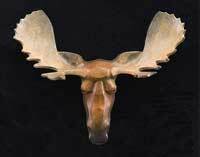 My first impression upon seeing photographs of Moose was that these are very strange and interesting looking animals! That impression was confirmed in later years when I saw these impressive creatures in and around Yellowstone and Teton National Parks. Actually, it is the Moose head that is so unusual, with its impossibly long nose and wing-like antlers, which made this animal a natural for one of my Masks. The Bobcat is probably the one wild cat seen in the "wild" by more people than any other. Aggressive and adaptive, it has managed to maintain its range over most of the continental United States, often in close proximity to man. Closely resembling our beloved house cats, we find the Bobcat both beautiful and fascinating, as it more closely resembles its larger feline relatives in its actions and lifestyle. This was made amply clear to me when I had the delightful experience of playing with a Bobcat kitten: fast, fierce and cunning, betraying it’s cute and cuddly appearance. 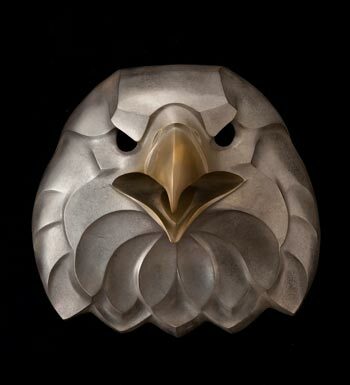 The magnificent Bald Eagle, our national symbol, needs no introduction. I imagine most of us feel a surge of emotion whenever we see one, which, I'm happy to say, happens more and more often these days around here, since they returned from the brink of extinction not so long ago. 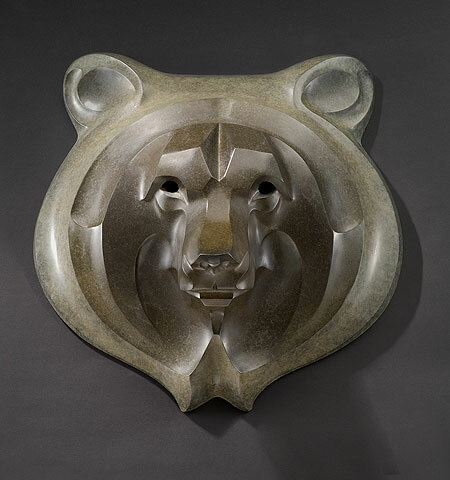 The Grizzly Bear (Brown Bear): the subject of myth and many a hunter’s tale of terror, or simply another of Nature’s magnificent creatures, uniquely suited for it’s own niche in the balance of nature. Either way you look at him, the full-grown male Grizzly is an awesome sight to behold. He’s also beautiful, with his own unique personality that is manifested in that impressive head and face, so full of the expression of power and quiet confidence that comes with his spot in the hierarchy of the food chain. No collection of iconic North American animals would be complete without a wolf. 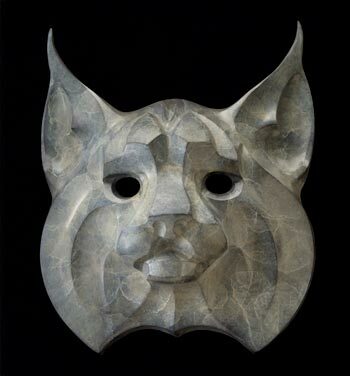 I am not planning to include ALL such creatures in my mask collection, but rather, all such creatures whose images fascinate me and offer fertile grounds for my interpretation of their beautiful and powerful forms. The wolf is definitely such an animal.